The Porsche Jensen FF was acquired for the Museum collection in 2016. Curator, Ulric Woodhams, was particularly delighted with the acquisition of Jensen FF 119/008, stating, “this car had been the most historically significant Jensen FF not owned by the Museum. In addition to the car’s historical significance, it has never been restored, thus making the car an important resource for the Museum. The so-called Porsche Jensen FF has remained in just two collections since 1976, and is probably the most original unrestored Vignale built Jensen in existance today. Manfred Bantle. Porsche Chief Engineer and test driver of the Jensen FF. The so-called Porsche FF, chassis number 119/008, had been ordered by Porsche, immediately after the launch of the CV8 FF at the 1965 Motor Show. The German company was keen to have a four-wheel-drive Jensen for evaluation. It was the end of June 1967 before Porsche’s car was ready for collection. Walter Bemsel, one of Porsche’s leading engineers, flew over to England to collect the Jensen and drive it back to Germany. A month later, and Jensen’s Managing Director, Carl Duerr, accompanied by Technical Service Manager, John Walker, flew over to Stuttgart at the invitation of Dr.Ferry Porsche. 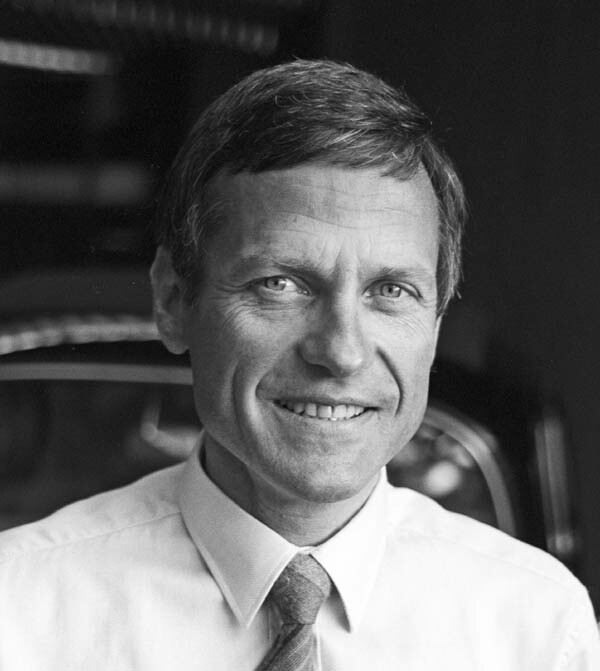 Once at Porsche, the two men met with Dr.Ferry Porsche, and his Chief Engineer / Chief Test Driver, Manfred Bantle. It was Bantle who spent most of 1967 and 1968 test driving the Jensen FF around the Porsche test track, and gaining an understanding of how the Ferguson four-wheel-drive system worked. For Duerr, it was a productive meeting, with him offering an open invitation for the Doctor to visit Jensen Motors. Porsche’s research and evaluation of the four-wheel-drive Jensen FF was completed by late 1968, and the car was sold ‘internally’ during 1969, from Porsche KG in Germany to Porsche System Engineering in Zug, Switzerland. PSE marketed patents, paid race drivers, and dealt with various other financial transactions. 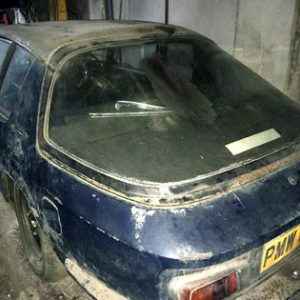 The car was brought back to Great Britain in that same year, and assigned the registration number ‘PMW 888H’. Bantle had learnt much from the revolutionary Jensen FF, evaluation which would not be wasted. Bantle’s inside knowledge of the FF, and its characteristics on the test track, led to his design of the ground breaking Porsche Typ 953, which made its debut in 1984. Even the front & rear with a bias of 60% back and 40% front, was directly in line with the Ferguson four-wheel-drive system at 63% back and 37% front. Although with the Typ 953, drivers could change the bias manually from the cockpit, something that could not be done on the Jensen FF. The Porsche Jensen FF was brought back into the UK in 1969 and assigned the registration number ‘PMW 888H’. The history of the car in those first years of its return to the UK isn’t yet known. 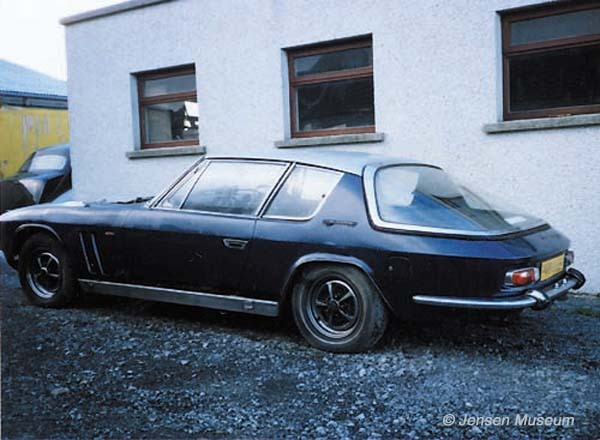 Around 1974, the car was for sale with the Scottish Jensen distributors, Rossleigh. Campbell Smith purchased the Jensen, coming to an agreement with Tom Sleigh the owner of Rossleigh in Edinburgh. Today, Smith cannot remember how he lost control, but it was probably down to sheet ice. Even four-wheel-drive will struggle with four wheels on ice. The Jensen was retrieved and deposited at Smith’s factory. During 1976, there was a takeover bid, and Smith was bought out. The Jensen, which was concidered a company asset, remained at the factory after Smith left. 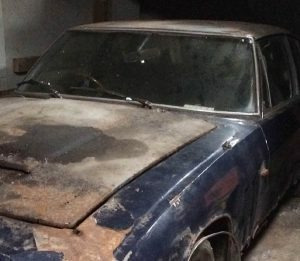 No repairs were undertaken to the car, and the Jensen, along with other assets were sold off at auction. Motoring journalist, Gerald Malin, lived outside Edinburgh. Malin had a large collection of classic cars including many old and desirable Lancias. He heard about the four-wheel-drive Jensen, and attended the auction. 119/008 was added to the collection. 119/008 photographed at Gerald Malin’s home during the 1980s. Confirmation that the Jensen was never used under the ownership of Malin, is the road tax disc for July 1976 – the last time the car was taxed (this disc remained on the car’s windscreen at the point the Museum acquired the car in 2016). Malin died in the late 1980s and Sotheby’s were brought in to sell the collection. 119/008 was given lot number ‘524’ and was purchased by car collector Walter Scott living on the Orkney Islands, Scotland. Porsche Jensen FF photographed in the Orkney Islands during 1990, at the beginning of Scott’s ownership. Scott, like Malin before him, acquired historic cars, but generally never restored them. He died in 2015, and the Museum acquired the car direct from the family in 2016. The Porsche Jensen FF photographed on the Orkney Islands during 2016. As an unrestored Vignale built Jensen, the car provides evidence of the many minute nuances of Vignale build. These have generally been lost on most Vignale built cars during later restorations. One example is the complex tailgate rubber, much simplified when manufacture took place at West Bromwich. The original Vignale tailgate rubber is still in place on the Porsche Jensen FF. According to Woodhams, some of these Vignale build nuances can now be replicated, and put in place where missing on other Museum Vignale built cars. This will lead to the Museum being in a position to offer these replicated Vignale parts to other restorers and car owners. Interior view of the Porsche Jensen FF. The car is complete, but has not run since 1990 due to a seized engine. Bodywork remains with its original blue paint, and with the original silver painted roof panel. Rust has attacked most of the lower panels, although the main chassis remains strong. There is some accident damage to the front panel, due to the incident that took place at Aviemore in 1976. 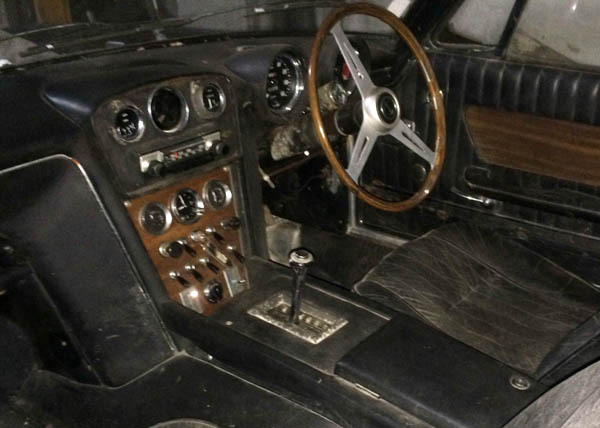 The interior remains with its original black leather, and all Vignale features are in place. The leather in particular remains supple, and apart from one seam split on the driver seat has no major defects. The main side carpets are original Vignale manufacture, the driver & passenger carpets have been replaced at a later date (probably 1970s). All brightwork and finishings are original to the car. The restoration will be dealt with in three distinct stages. This will involve rebuilding the engine, transmission and braking system, and completing any work involved to have the car in a running condition. The rebuilding of the engine in particular, will be dealt with from a heritage perspective. It is Woodhams’ opinion that since this car was used on the Porsche test track, and had a defining roll in the design and build of the Porsche Typ 953, that as much of the internal parts of the engine that can be saved and reused, should be. Initial detail photography of the entire body | chassis, including all applied parts such as rubbers, brightwork etc. The Museum’s intention will be minimum restoration to remove rust, back to good metal. As much of the original chassis and panels will be kept, and all original metalwork stabilised where necessary. Where possible we will leave original paint (areas such as under sill plates, under the underseal finish), anywhere it doesn’t conflict with the stability of the car for the future. The leather will be cleaned and treated. The driver seat squab will be sewn back in place. The original Vignale manufactured carpet parts will be cleaned and left in place. New driver & passenger side carpets will be sourced to match as close as possible. All original carpet underlay will be carefully cleaned and left in place if possible. If they require removal due to welding work, the removal will be exercised in such a way that they can be refitted after any metal work has taken place. 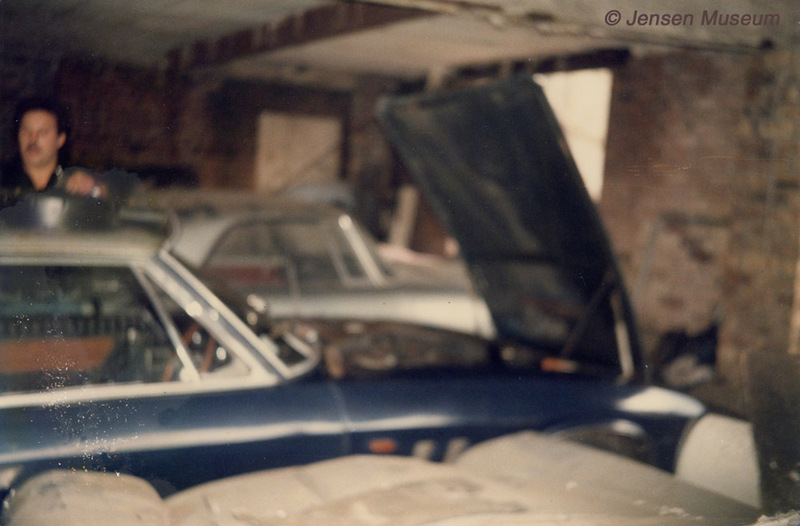 REQUESTS: We would like to hear from anyone who has information about the Porsche Jensen FF between 1969 and 1974. ACKNOWLEDGMENTS: Jens Torner, Porsche Historisches Archiv, Stuttgart | Marco Marinello | Danny Hopkins, Practical Classics magazine | Campbell Smith. COPYRIGHTS: All images and text copyright of The Jensen Museum | Porsche Historisches Archive – Stuttgart.